Second Life Signup – Virtual Ability, Inc.
On the next screen, you will enter your User Name. This is your account name, and must be unique. You won’t be able to change your User Name later, so choose wisely. However, you will be able to later change (weekly if you want) your display name – which is how most people in Second Life recognize you. On the same screen, you will also select your initial avatar, which is what your character looks like within Second Life. The appearance you choose is just to get you started – you can always change it later. When you press “Create Second Life Account”, the system will check to see if the User Name you selected is available. If not, you’ll need to enter a different User Name. On the following screen you’ll need to enter several pieces of information: an email address, your date of birth, a password, a security question (picked from a list), and your answer to that security question. If there are no issues with the previous steps, you will see a notification that your account was created successfully, and see a link where you can download the Second Life viewer software on your computer. Download and install the Second Life viewer at that point, then start it up. 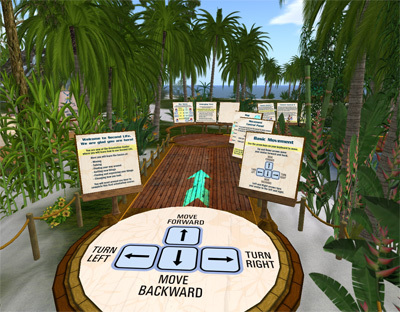 Your avatar will then appear on Virtual Ability island, at the start of a training course that will show you, step by step, how to walk, fly, communicate, and perform the other essential tasks of this exciting new world. You can proceed through the training course at whatever speed you want. You can go through it all at once or in several shorter sessions, and you can always come back later. In fact, there is no requirement that you even go through the training course at all. You can log out any time you want, and when you log back in, your avatar will be right where you left off. You’re now ready to create your Second Life account. Clicking on the link below will open a new window. Click anywhere on the “Welcome to Second Life” box on that window to start the account creation process. We hope you enjoy your Second Life®! We look forward to visiting with you there! If you complete the sign up process, you are choosing to provide us with your email and IP address, which would constitute an “opt-in” with regards to the GDPR.